Obama is a “local boy hero” in Kenya. His Presidency has given hope and encouragement to all. 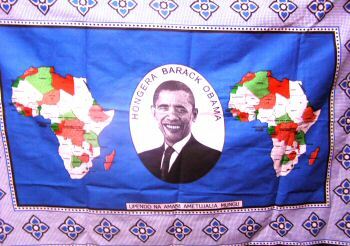 The Kiswahili saying around President Obama’s head reads “Hongera, Barak Obama”, which means “Congratulations, Barak Obama”. 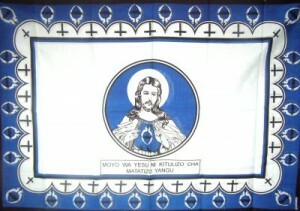 Across the bottom of the kanga, “Upendo na Amani, Ametujalia Mungu,”- “Love and Peace, May God empower you.” This blue kanga panel is approximately, 42″ x 60″. 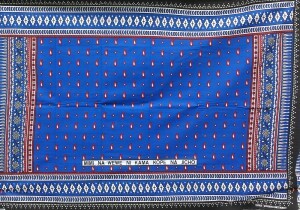 Tags: cotton kanga, cotton wrap, obama kanga.